Meanwhile, on the other screen, the exceptional event occurs. Charles has been invited to a reception in Paris; Emma is excited and buys a new dress. 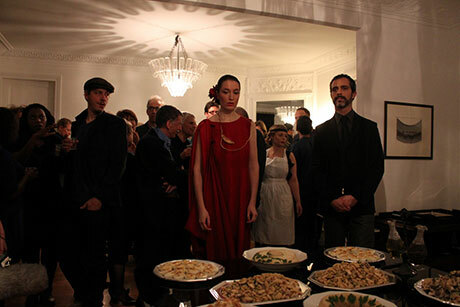 Misunderstanding the phase “tenue de ville” on the invitation card, she over-dresses. For her, “city” means glamour. Thus the dreamt-of event in the Glamorous World turns into a nightmare. The other guests freeze when they see her. They do not admit either Charles or Emma into the small circles of their conversations, and everything Emma does in seeking the limelight is slightly out of place. She has an awkward conversation with a man, then dances with him, and that’s it: more loneliness, isolation, and shame. This work concerns moods. 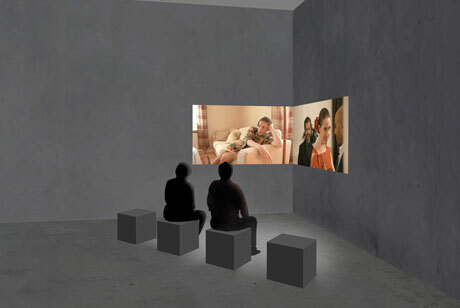 In this case, visitors sitting in the corner of the space can easily move from one screen to the other, according to their mood. However, the contrast to be expected, between the tedium at home and the whirlwind of excitement at the reception, is again deceptive. Hence, even if the two screens are open to quick or slow viewing, to narrative coherence or rapid change, it is not so easy to develop and maintain a particular mood. The visual beauty of the images enhances this uncertainty. Moments of painful awkwardness cut through the lush colours of the images like a hot knife through cold butter. In a corner, at a right or slightly dull angle, two screens present a contrast. One of them shows the endless reiteration of the same small, meaningless acts that constitute domestic life when the husband goes out to work and the wife stays at home with little to do. The other screen is devoted to the hope that can be inspired when something exceptional happens. The installation Boredom Sets In presents this contrast, which is also one between description and event, or between passivity and agency. But again, the contrasts we expect, trained as we all are in thinking in binary oppositions, is challenged. On the left screen, the unbearable boredom is first depicted in small meaningless acts, increasingly futile and even a bit mad. This exasperating boredom is, however, interrupted when a neighbour appears. After stalking Emma’s house for a while, the young man comes forward and invites her for a walk. They talk and Emma seems to enjoy the change of scenery, and the ability to talk to someone. The young man is, however, clearly unable to understand her. What happens next?